We all have habits -- we sit at the same spot at the table, grab the same spot to watch TV, etc. This is my spot to watch TV, use my laptop, and read. Sometimes, particularly in the late afternoon, I may have a tendency to doze in this spot. And when that happens, my head sometimes snaps back and bangs into the brick wall. Banging the back of your head into a brick wall is never a good idea, particularly if you take a blood thinner. So today, after I was finished preparing dinner, I came back to the sofa and found this pillow sitting behind my spot. I asked Mike if he put it there. "So I wouldn't bang my head if I fall asleep?" 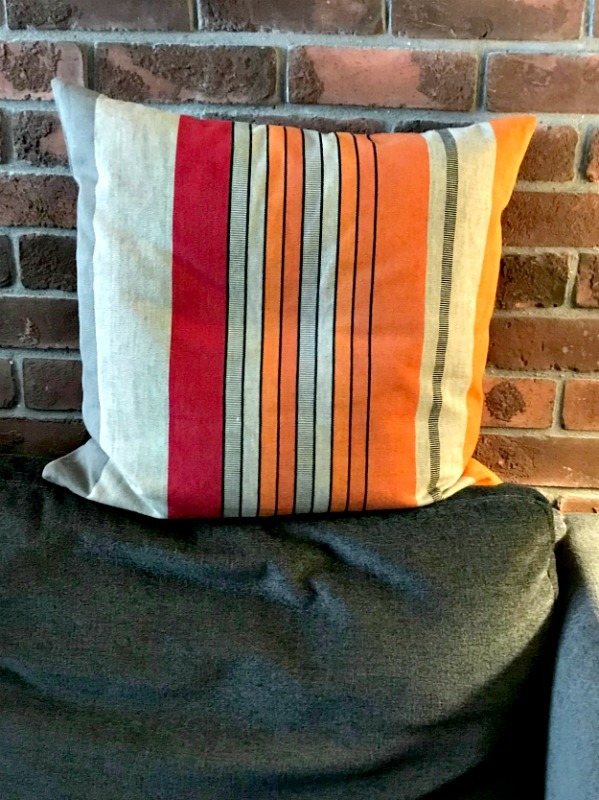 When you're in your 60s, this pillow is love. That is so sweet!!! You are so lucky to have a thoughtful hubby. But then, you chose him...very smart. Awww, Mike is the best! So sweet! Hope all is going well for you. All the heart eyes in the world! He loves you. Take care of your head for him, Joan. BTW, I really like that pillow. That's love. And great observation, too.